Industry veterans explain why ZBrush is the star of all your favourite films and television shows. Digital sculpting tool ZBrush has long been a contributor to the world of television and 3D movies. Prior to ZBrush, figures were sculpted in clay before being scanned to produce 3D assets, in a process that was as time-consuming as it was costly. Such was its game-changing nature that in 2014 Pixologic co-founder Ofer Alon received an Academy Award for his design and implementation of the software. CG modeller Jose Limon retells his first encounter with the tool: "ZBrush was first introduced to me while I was attending The Art Institute of California-Inland Empire, somewhere between 2007 and 2011." Currently lending his talents to the teams at A52 VFX and Elastic, Limon has seven years' experience in crafting characters for TV, film and animation, primarily using ZBrush. "I started getting a glimpse of what ZBrush was capable of through the art that other students were creating," he continues. "Eventually I took an introduction to ZBrush course that focused on character and prop creation, I fell in love with the software there and then." Since then Limon has worked on the main title sequences for The Man in the High Castle, Westworld, Daredevil, Luke Cage, and Fantastic Beasts and Where to Find Them, among others. His TV work has earned him three Emmy nominations and one win. 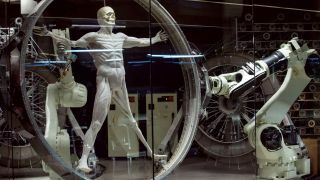 Recently Limon utilised ZBrush on the main title sequence for season two of HBO's science-fiction series, Westworld. The software helped him to realise the complex visuals of a mother and newborn baby that appear throughout the sequence. "I knew that we would reveal some portions of their underlying anatomy in the sequence," he explains. "But we were unsure where exactly that would be. I had to approach it in a way where I could easily go back and swap things around. "The first stage consisted of setting up a ZBrush master file for the anatomy of the models: it consisted of a T-posed human body with as much anatomical and skeletal detail as possible. At this early stage, the file was put together from various sources, some recycled models and newly sculpted pieces to fill in the gaps." He continues: "One of the challenges on my end was posing the mother and newborn in a way that felt natural. There was no rigging involved so everything had to be done by hand in ZBrush. With the pose approved, the next thing to do was to mask areas of the model where the underlying anatomy would come through. Going back to the ZBrush master file, I took the portions that would be revealed and fitted them into place on the posed model." Finally Limon was responsible for merging the model's anatomy with the outer skin, creating a hollow shell. He explains: "Using the remesh feature in ZBrush, a rough shell was created. From there it was DynaMeshed and re-projected back to the original details. No displacement information was used for the final renders. In order to keep all the high fidelity detail, I optimised the final sculpt using ZBrush's decimation features. This mesh could then be passed on to the artist working on the final model." It's clear that ZBrush was a crucial part of the creative process behind this acclaimed sequence; according to Limon it's all down to the flexibility that the software provides, but that's also what can make it one of the trickier 3D software to master. "As a beginner, it might seem overwhelming at first, perhaps due to the way the UI is set up or where the navigation controls are placed," says Limon. "ZBrush should be used in a non-linear workflow, this is a software where one can achieve the same result in a multitude of different ways and half the time those are radically different from one another in terms of motive or mindset. It's a very improvise-friendly software and one that helped me find the right approach to this sequence. All it took was some willingness to try new things and not being afraid of failure." For Double Negative's creature and character designer, Madeleine Scott-Spencer, ZBrush has been a part of everyday work since 2003. She adds: "I use ZBrush every day to generate concept images and digital sculptures that will serve as the beginning of the modelling process." With a background in make-up effects, prosthetics and physical sculpting, Scott-Spencer previously worked with New Zealand-based Weta Workshop and Weta Digital. Since making the jump to ZBrush she has never looked back, authoring several books on the software and creating the Introduction to ZBrush training videos for The Gnomon Workshop. Scott-Spencer has also become adept at using ZBrush to create fine art and commercial figurines, having used the software to create many of Weta's Hobbit collectibles. "At Gentle Giant Studios back in 2006 we were the first to create a commercial collectable figure using ZBrush, it was a Grindylow from Harry Potter," she adds. "We sculpted it in ZBrush and then had to work out decimating in other software as there was no Decimation Master yet. We then printed and recast it in wax to part it for moulding. Today the decimation is much easier and I would do all that parting in ZBrush." According to Scott- Spencer there is no alternative to ZBrush when it comes to digital sculpting: "Nothing else comes close and it has tools specifically designed to assist the artist going to 3D print, such as Decimation Master and 3D Print Hub." Digital sculptor Glen Southern was an early adopter of ZBrush, "I've been using it since 1999, which sounds crazy to me when I say it out loud," he admits. "I picked it up on the cover of a magazine and instantly fell in love with it. It was different to the other tools I was using and wasn't used in any production environments back then. There was no DynaMesh, ZSpheres and only a limited amount of brushes. It really became popular once artists started using the high-resolution data for normal maps in games and in displacement maps for other programs." Southern, who also runs his own studio, has been helping to meet the ever-growing demand for training in digital sculpting for over a decade. Such is his proficiency with the software that Southern was asked to help the art department on season two of the horror series Penny Dreadful. Ordinarily ZBrush would be employed in post-production, but the demands of this project called for a different approach. "They wanted to build a witch's castle and the production designer wanted complex architectural pieces made in ZBrush and then carved in polystyrene on a five-axis machine," he explains. "The blocks were 2.4 metres high and the final item was sent off to a department for hard coating, which made the piece feel like concrete. I was making gargoyles, bats, ram heads, columns and a host of sculpts that you might see in an ancient castle." When asked what made ZBrush the right tool for the job, Southern puts it down to its compatibility with other software. "I was working with files from SketchUp delivered from the main draftsman working on the project. They could be as simple as a cube scaled correctly, a piece of wall, or sometimes an arch or a window. Those files gave me the dimensions and I would deliver low- and highpoly versions back to him. The low poly went back into the main SketchUp scene and the high poly was sent to the five-axis machines. ZBrush is perfect for those kinds of jobs – you can make insanely complex organic shapes and deliver them back decimated and usable for several tasks." Though ZBrush has become an industry-standard tool, its ever-evolving nature can make it a daunting proposition for beginners. Scott-Spencer has some advice for those looking to get stuck into a career in sculpting for film and television: "Look at artists outside the digital world for inspiration and sketch in ZBrush every day. I encourage my students to do a daily sphere sketch, just a head or a face on a poly sphere using DynaMesh or Sculptris Pro mode. This will help build your confidence." According to Southern, tutelage is crucial for getting to grips with ZBrush quickly: "Once someone has taught you how to work with the interface and configure it to your needs it is no longer a barrier to you. If you try that on your own with tutorials you can end up taking ages to get to grips with things. Just learn the basics and the rest will come over time. Focus on just a few brushes rather than trying to understand the hundreds that are available." Limon also urges beginners to gradually embrace the freedom that the software provides: "Even though ZBrush is a very robust software, it's best to stick with the defaults and progressively integrate features as you start to expand your knowledge and technique." He concludes: "I recommend to strictly focus on the sculpting side and limit your tools to a few default brushes. This will force you to work loosely, make mistakes, and improvise solutions. This is the way to see and create as an artist, sculptor and visual storyteller. It's going to take time and effort, so get on with it." This article was originally published in issue 239 of 3D World, the world's best-selling magazine for CG artists. Buy issue 239 here or subscribe to 3D World here.